Community Action Inc. will introduce a FREE 12-week course intended to provide training in the English language to ensure greater workplace success. 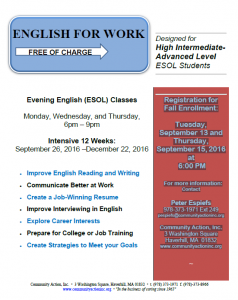 This course is designed for High Intermediate-Advanced Level ESOL Students beginning September 26th. Registration for Fall Enrollment: Tuesday, September 13 and Thursday, September 15, 2016 at 6:00 PM For more information: Contact Peter Espiefs 978-373-1971 Ext 249 pespiefs@communityactioninc.org.